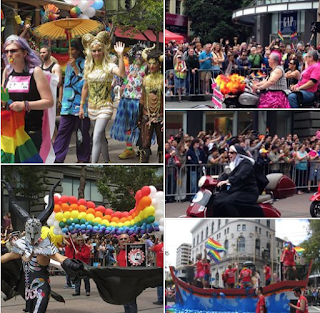 Mystery Fanfare: Books at SF Pride Parade! San Francisco knows how to throw a party! Yesterday's Pride Parade was the best ever. Almost half a million people turned out to participate, watch, and interact! What a great day! The variety of organizations, companies, politicos, and other groups was staggering. Apple must have had over 1000 marchers, waving rainbow flags, and interacting with the crowd. The Netflix float was awesome with 'stars' from some of my favorite Netflix originals. Starting at 10:30, the parade was still going at 4:30, and that didn't include the entertainment and 'party' at Civic Center which began at 1:30. I believe that lasted until the wee hours of the night. Books were front and center at the Parade. The American Library Association was in town for its annual conference. What a weekend for it. Several members of ALA marched in the Pride Parade with posters of book covers celebrating gay themes. Also marching was the SF Library Bookmobile, with its attendant librarians, friends, and placards. And, in case you want to see a few other photos from the Parade, here are some snaps I took. That is so cool, Janet. Thank you for sharing all the photos. The Pride parade in Seoul, Korea, had been banned, but rescheduled and happened to fall on the same day. It was peaceful (despite a very loud "Christian contingent". Parade participants were guessed at 22,000. The "objectors" claimed to be 15,000, but it was said to be around 4-5 thousand. The SF parade was so beautifully colored.